To make crepe batter, whisk together 1 cup of flour and ¼ teaspoon of salt in a large bowl. In a separate bowl, blend ½ cup of milk, ½ cup of water, 2 eggs and 2 tablespoons of melted butter. Add to the flour and salt and stir until smooth. Let batter rest until ready to use. To make the crepes, spray a small skillet pan with cooking spray and put over medium high heat. Pour about ¼ cup of the batter into the pan, swirling and tilting to coat the bottom of the pan. Cook until edges are light brown in color, about 2 minutes. Flip the crepe and cook the other side for about 1 more minute, or until done. Stack crepes aside when ready to assemble. To make the strawberry sauce, add strawberries and ¾ cup of sugar to a medium saucepan. Bring to simmer over medium heat, until sugar has dissolved and the strawberries have softened. If necessary, adjust sugar amounts to sweeten to your taste. Set aside. To make the ricotta cheese filling, combine ricotta cheese and confectioners sugar and mix until thoroughly blended. Adjust sweetness to taste. To assemble the crepe, spoon 2 tablespoons of filling on the lower end of the crepe. Fold the bottom of the crepe over the filling. Fold the remaining sides over to make a little package. Repeat with the remaining crepes. 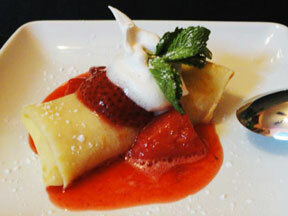 Top the crepe with a ladle of strawberry sauce and a scoop of whipped cream and sprinkle some confectioners sugar. Please download Acrobat Reader to view PDF files.